Last week, Luke Bryan sold an incredible 527,783 units of his new album "Crash My Party," placing him firmly at #1 on the Billboard 200. This week comes word that he's once again expected to be at #1. 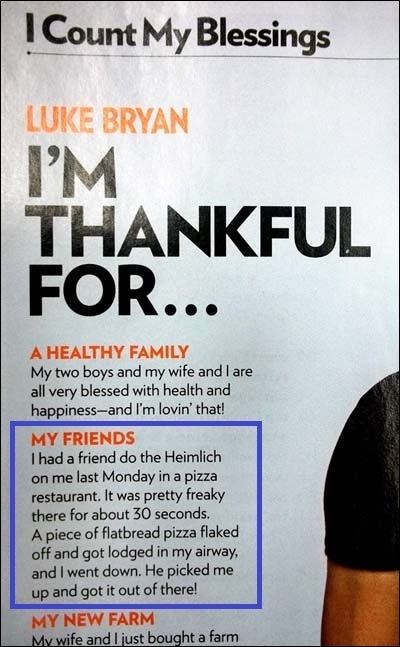 On his blog, (Peter Heimlich) urges journalists to investigate potentially fraudulent stories about the maneuver being successfully used -- was country star Luke Bryan telling People Country magazine the truth about an errant piece of flatbread pizza? November 8, 2012: Was country music star Luke Bryan lyin' about being rescued from choking? Not even his mother will back up the story. If the story is fiction, I wonder if first responders or others who have participated in life or death choking incidents would be amused? If any reporters or fans want to ask Bryan or his manager for details -- date of the incident, his friend's name, the name/location of the restaurant -- click here for his tour dates. He's managed by Red Light Management, a powerhouse agency based in Charlottesville, VA headed by industry mogul Coran Capshaw. He's at (434)245-4900. Per this e-mail exchange, one of Capshaw's employees promised to answer my questions, then disappeared. My guess is he checked with his client and discovered that the entire story was cooked. If anyone follows through, I'd be interesting in learning the results.